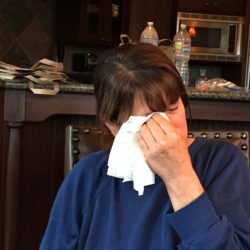 If you’ve been a follower of At Home with Vicki Bensinger then you probably recall my crazy summer moving my daughter. Last week she called to tell me she had the best appetizer at the Nordstrom restaurant, Ruscello. She told me they placed a wood plank on the table holding a mason jar, layered with ricotta cheese, pesto, and tomato jam. To go with the appetizer, was crostini. She raved about this appetizer, and how the flavors melded so well together, and that the presentation was stunning! “This would make the perfect holiday gift. You’ve got to try to recreate this,” she said. This would be beautiful in a half-pint mason jar as shown above. The jars I used were Ball canning jars. Once filled, place in a cellophane bag and tie with a ribbon. These would be ideal to bring to a dinner party or for a hostess gift. Since the homemade ricotta cheese is best consumed within 3 days, I’d suggest making the ricotta the day you plan to gift it – just in case it’s not eaten right away. Always be sure to attach instructions! 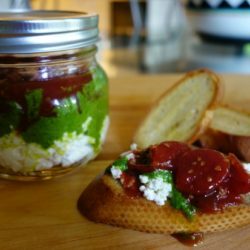 Rather than list the recipe for Homemade Ricotta Cheese, Spinach Pesto, and Tomato Jam, I will link to each of these in the instructions below. Each recipe takes no time to prepare, and all are easy to make. Why wait until the holidays to savor a jar? Gift it to yourself this weekend, or the next time you’re having company over. A blend of flavors that feels like a party in your mouth! Positively delicious! 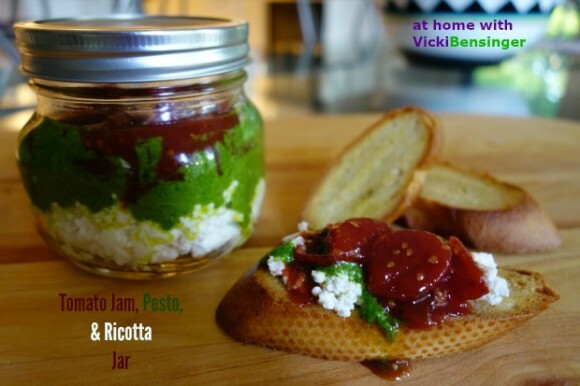 Prepare the homemade ricotta cheese, spinach pesto, and tomato jam. Allow chilling time for each recipe. Once chilled, place approximately 4 heaping tablespoon of ricotta cheese in the base of a half-pint, wide mouth, Mason jar. 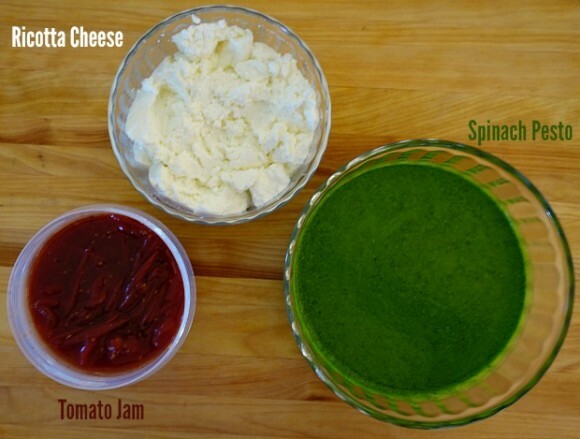 Add 3-4 tablespoons of Spinach Pesto on top of the Ricotta Cheese, enough to cover the cheese. Try not to get any on the rim of the jar. Top with 4 tablespoons of the Tomato Jam so it fills the jar. Leave about a half-inch space above jam, so the lid can be placed on without smashing the ingredients. Place in the refrigerator until ready to serve. Serve with a spoon for scooping onto the crostini. What a clever idea! The crostini looks very delicious, Vicki. Thanks Angie, it is delicious! I hope you’ll try it. Please let me know how everyone likes it. 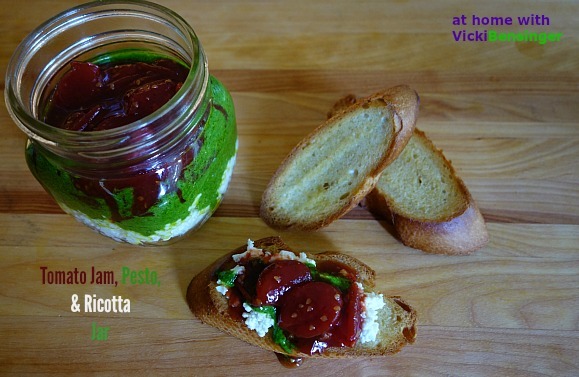 I’m not sure what Nordstrom’s recipe is but I’ve made the homemade ricotta, tomato jam, and pesto, both basil and spinach. I used my recipes and got a big thumbs up from everyone that tried it. I made the spinach pesto in my version vs. basil since my family prefers the spinach since it’s not bitter but also I’m finding good basil challenging to find. Of course, if you grow it in your own backyard that won’t be an issue. What a terrific appetizer and/or gift! I cannot wait to make you tomato jam! 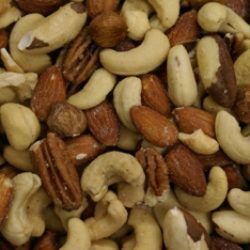 They’re all great on their own or combined to make a beautiful, tasty, and unique appetizer. Let me know what you think if you try it. Great idea! The colors are beautiful together too. Thank you Susan. I think this would make a perfect gift for the holidays. 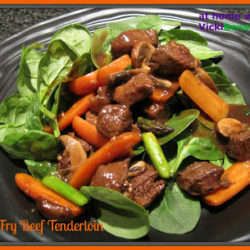 Oh my gosh Vickie, this looks and sounds amazing. Such pretty colors! Thank you Chris. I actually made quite a few smaller versions of this to share with my neighbors and they’ve all called to tell me how much they loved this. The flavors all work together so well. I hope you’ll try it. I know the ricotta can be a bit dangerous because it’s soooooo good. I haven’t made it with the lower fat milk and cream but I’m sure it’s not near as decadent as the full fat. I can literally eat it with a spoon. Actually I can do that with all 3 condiments. What a neat idea. Your daughter know good food and a fancy one. This looks amazing. i will definitely be making this. Would be so good for school lunches too. Perfect crostini. My sister spread it on brioche, then layered turkey on top to make a sandwich. She said it was so incredibly delicious, she wished I had brought over more. Be creative with all the things you can put it on and add it to. It’s so good. I hope you like it as much as we did. Thanks for stopping by. You won’t be sorry. It’s so good! This is such a pretty idea, and a great gift! I agree. Everyone that tried it absolutely loved it. I don’t think you could go wrong serving it to guests or gifting it. This is THE coolest idea! Thanks for the inspiration. Oh thank you. I appreciate it. I like spinach pesto, too, even with walnuts! (Try kale?) this is a great idea. I tried a tomato jam once, didn’t like it. Will try again since your daughter raved so! My family isn’t a fan of kale so I don’t know that they’d like it. However, I will give it a try. Please try my tomato jam as well and let me know what you think. 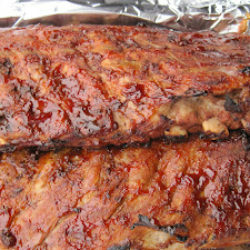 I need to make this using my Tomato Red chile jam. This is such a smart snack/appetizer/lunch. Great idea Vicki! Thanks for sharing! Oh yum, tomatoe red chile jam sounds fantastic. I’ll have to stop by to get your recipe.